Two-year-old Rieno Tesoro, a New York-bred daughter of Speightstown bred by Oak Bluff Stables, LLC and foaled at Berkshire Stud in Pine Plains, could hardly have traveled farther from the place of her birth to begin her racing career, nor gotten that career off to a better start. 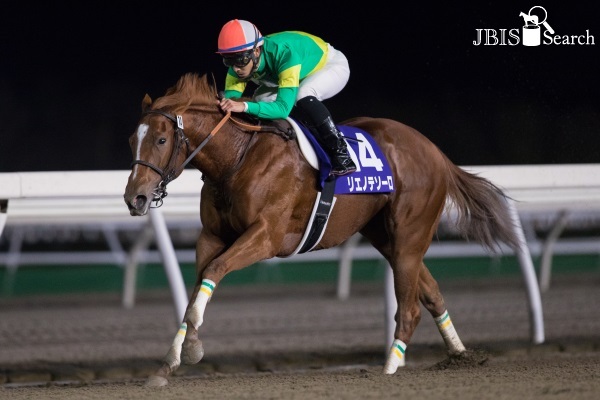 Purchased by Japanese owner Kenji Ryotokuji out of the Fasig-Tipton select yearling sale in Saratoga for $250,000, Rieno Tesoro won the listed Zennippon Nisai Yushun (Jpn I) on Wednesday, December 14 at Kawasaki Racetrack. Rieno Tesoro now boasts two listed stakes victories, a perfect four-for-four record at three different National Association of Racing (NAR)* racetracks, and an earnings bankroll amounting to ¥78,231,000 (over $650,000). Trained by Ryo Takei, Rieno Tesoro won her first three starts at 1200 meters (approximately six furlongs). After a successful debut at Sapporo racetrack on August 27, she returned to the same venue only nine days later to pick up her first victory against winners. Venturing into the stakes ranks next time out on October 13, the filly obliged bettors who backed her heavily to win the Edelweiss Sho (Jpn III) at Monbetsu Racetrack, where she beat 15 rivals after a stalking trip. On Wedesday Rieno Tesoro stretched out to nearly a mile (1600 meters) around two turns in the Zennippon Nisai Yushun and, as the 2-1 favorite, once again vanquished a huge field under jockey Hayato Yoshida. The chestnut got away well from her inside post, and saved ground through the clubhouse turn and along the backstretch in fourth and third positions. Angling out out the three-path in the latter part of the far turn, Rieno Tesoro drove to the wire, passed the frontrunners and scored a decisive 3-length victory in a final time of 1.42.8. [YouTube Replay]. Rieno Tesoro’s dam Akilina should be a familiar name to those who follow the careers of stakes-caliber New York-breds. An Oak Bluff Stables homebred by Langfuhr trained by Christophe Clement, Akilina was a multiple stakes winner on turf and graded-placed runner. Oak Bluff Stables purchased Akilina’s dam, the Gulch mare Fahamore, for $37,000 at Keeneland’s 2003 November sale Akilina retired with six wins, four seconds and six thirds in 26 starts, and $316,460 in earnings. With only one other foal to have started so far — a very accomplished one — her broodmare career is one to watch. Akilina’s first foal is New York-bred sophomore Governor Malibu, by Malibu Moon. Winner of the Gander Stakes in February, Governor Malibu went on to finish second in both the Federico Tesio at Laurel in April and Grade 2 Peter Pan at Belmont Park in May. He followed up with solid fourth to Creator in the Grade 1 Belmont Stakes. In the latter half of the year Governor Malibu finished second in the Grade 2 Jim Dandy to newly-announced New York sire Laoban, and second in the Empire Classic. Currently Akilina has an unnamed yearling filly by Ghostzapper, a weanling colt by Super Saver and was bred to Uncle Mo this year.